These signs read "Edward Ermold Company / Automatic Labeling / And Power Corking Machinery." Parts of the lower 2 strips have been over-painted by what looks like "Weston Corporation." In 1896 Edward Ermold, machinist, age 44, applied for passport, in which he stated that he was born 4 Sept. 1852 in Göttingen, Germany, that he emigrated to the U. S. on board the S.S. Perry sailing from Le Havre, France, 27 Aug. 1880, and that he became a naturalized citizen 19 Oct. 1886 in New York City. His naturalization petition filed 19 Oct. 1886 gave a slightly different arrival date - i. e., July 1879. Ermold can be found in the U. S. Census reports of 1880, 1910 and 1920. In 1880 he was 27 years old and lived at 57 First Ave., Manhattan. Thirty years later (1910) he was 57 years old and lived at 320 W. 14th St. In 1920 he was 67 and lived at 225 W. 86th St. He died 11 May 1936. The death notice in the New York Times, 13 May 1936, read in part, "Ermold - Edward, on May 11, 1936, at his home, 225 West 86th St., beloved father of Mrs. Emma J. Guthrie. … Interment Woodlawn Cemetery." 225 W.86th St. is the address of a landmark apartment house known as the Belnord (Hiss & Weekes, 1908-09). A story regarding his estate (New York Times, 31 Oct. 1936) read, "Edward Ermold, who died May 11, last, left $1,210,798 gross and $1,185,885 net, the appraisal showed yesterday. He owned securities worth $1,029,143. The residuary estate went to Emma J. Guthrie, daughter, of 315 West 105th Street and Elsie B. Bischoff, granddaughter, of Tenafly, N. J." This ad for Edward Ermold advertised "Self-Gumming Envelope Folding Machines." This ad for Edward Ermold appeared in a publication called Pure Products, Vol. III, 1907. They seem to have been making machinery that added labels to the bottles for several major breweries. 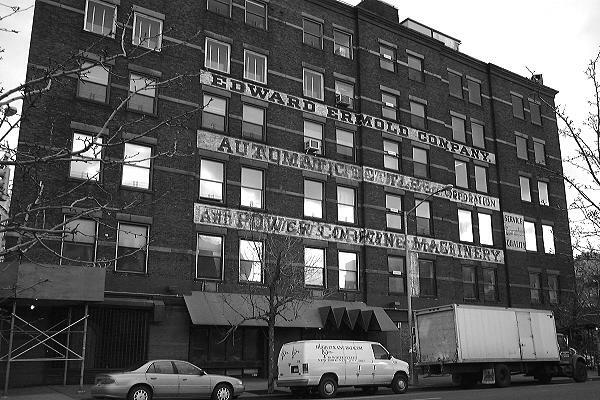 Edward Ermold Company was located here at 652 Hudson St. at the corners of Gansevoort and 13th Streets from 1892 until the early 1950's. Recent renovations of this building removed these signs in late 2001. A photo by Percy Loomis Sperr (1890-1964) shows these signs in 1934. This can be found on the New York Public Library's Digital Collections.